What are some of the reasons why guests choose to book with an online travel agency (OTA) over a hotel’s website? According to an August 2016 Phocuswright report, the #1 reason is that OTA websites are easy to use. There is also a widespread consumer misconception that OTAs offer better prices than booking directly with a hotel. We sat down with Charlie Osmond of Triptease to discuss some of the ways his company is helping hotels remedy this problem. Triptease builds digital tools that create better experiences and relationships between hotels and guests. 1. How did you come to work for Triptease? What is your interest in the hospitality technology space? We spent months interviewing guests and hotel staff to understand the first-hand trials and tribulations various parties were going through. Too much data overwhelms travelers and distorts the industry. In delving deeper and deeper into this problem, we developed Price Check, a widget that sits on a hotel’s website and booking engine displaying real time prices across the web. Since then, our Direct Booking Platform has grown and we now offer a suite of digital tools that both encourage transparency to guests and improve relationships with guests – something that’s truly changing the game in the hospitality industry. 2. What are some of the most common concerns you hear from your hotel customers? Hotels need to drive more direct bookings. Our customers voice this concern, which is why we strive to continue developing products to meet their needs. In this day and age, it’s not just our customers either; it’s the industry as a whole. The distribution mix has shifted greatly over the years and we’re helping address that concern through the Direct Booking Summit. It’s the perfect opportunity to gather hoteliers and discuss the state of the industry, ideal distribution mixes, and what really works when it comes to driving more direct bookings and improving the hotel-guest experience. 3. Do you have any advice for hoteliers faced with these challenges? The point is that by driving direct bookings, hotels can improve the relationship hotels have with their guests, establish a transparent relationship, and provide loyalty benefits and perks that travelers are constantly seeking out in today’s world. 4. What might this advice look like in practice? Do you have any real world examples? Rewarding guests who book direct is really important, and a small gesture can go a long way. For example, The Strand Palace, one of London’s most iconic hotels and one of our first clients, offers guests a complimentary bottle of Prosecco when they book direct. 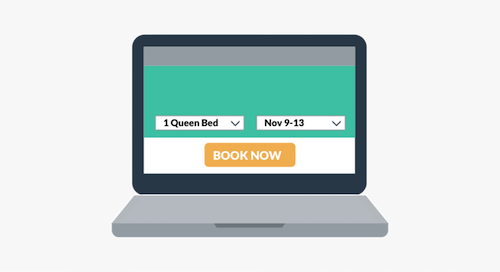 Their use of Enchantment messaging helps reassure visitors; just as they’re about to leave the website, customized messaging sends a visual reminder that booking direct means not only getting the best rates, but better benefits. Price transparency is also really important. The number one reason visitors leave a hotel website is because of the misconception that the price is cheaper elsewhere. Steigenberger, a hotel group with 89 hotels across Europe and Northern Africa, introduced our Price Check widget to promote price transparency last year. Since implementing the widget, they have seen a 63% increase in conversion on their booking engine. Keeping your price lower than third party intermediaries, or at least in parity, will do wonders for increasing direct business. 5. What do you think will be the most important action item for hoteliers in 2017? First and foremost, hotels are actually cheaper direct 53% of the time – up from 51% a year ago! If that’s not proof about why it’s better to book direct, I’m not sure what is. Additionally, as hotel’s enforce efforts to keep OTAs in line, third-party providers have been undercutting hotels less frequently. This means that OTAs are only cheaper 14% of the time, a decrease from 21% in 2015. With parity now being maintained 32% of the time (up from 27% a year ago), this data shows a clear trend in travelers booking direct. If these changes are just over one year, imagine the state of hotels’ healthy revenue streams and guest relationships another year from now! We’ll be sharing plenty more of this type of data, along with best practices on how to drive direct, at the Direct Booking Summit. If you’re interested in attending and hearing more about special discount opportunities, email hq@directbookingsummit.com for more details. Co-founded by Charlie Osmond, Alasdai Snow, and Alexandra Zubko, Triptease has achieved accolades such as the 2015 Phocuswright European Travel Innovator of the Year and People’s Choice Award, with the Price Check widget securing an HSMAI Silver Award for Innovation. The company works with over 12,000 hotels to promote trust and transparency to guests. Charlie Osmond, Chief Tease, built his first business straight after graduating from Oxford with a degree in engineering. He was named Young Entrepreneur of the Year by Esquire Magazine and one of HSMAI’s ‘Extraordinary Minds’. Charlie’s also a member of the British Airways Business Advisory Board.